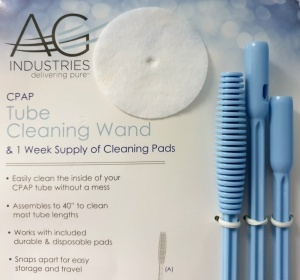 This Tube Cleaning Wand is designed for safe cleaning of 22 mm standard CPAP, BiPAP and Non-Invasive Ventilator Hoses without the risk of damaging them. Please note it is NOT compatible with slimmer 15 mm hoses. The wand comes in 3 sections which is easy to clip together and, therefore, easy to store or travel with. The moist disposable cleaning pads do a good job of cleaning the inside of the tube. 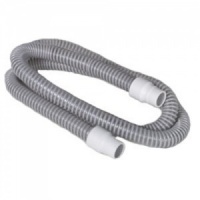 For people using a hose cover, the cover can remain in place on the hose when using the cleaning wand, so cuts down on having to soak the hose in water. No more frustrations with waiting for the hose to dry for people who soak their hoses in water. 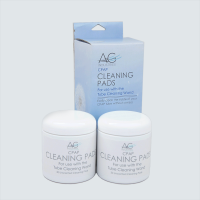 The disposable pads are moistened with an unscented 99% natural solution and contains no alcohol. Clip the 3 sections of the wand together. Place a new cleaning pad over the tapered end of the wand. Disconnect hose from the machine and mask. Insert the wand into the hose and slide back and forth in short motions down the length of the tube to clean it until the wand is fully inserted. Remove wand and repeat the above process from the other end of the hose. 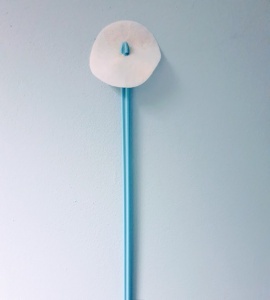 After cleaning is complete, discard the disposable cleaning pad then disconnect the sections of the wand by depressing the small button at each joint. With careful care, the provided plastic packaging bag can can be used to store the wand. This cleaning wand is NOT designed for slimmer hoses less than 22 mm width. The moist cleaning pads must not be put into the hose if dried out and each pad is designed for a one time use. Even though the product is very good and the quality is excellent, I have the new Airsense 10 ResMed machine with the climate hose. Unfortunately due to a restriction in the hose entrance I am unable to use the rods and cleaning pads. The perfect tool for ensuring the tubing is free from all foreign matter. It's just the ticket. 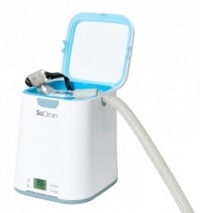 This product really solves the problem of cleaning the large cpap tube. Simple idea but great that you can buy it from Hope2Sleep. I cannot yet review the cleaning wand as I have not had time to use it, but am very impressed with the quality of the service at Hope2Sleep. I had some queries and emailed them and had an immediate reply, and they were also very helpful when I had to ring them about an order which I had got wrong. I would recommend their customer service to anyone and wish all customer service were so helpful! Thank you and it's our pleasure  Hope you're finding the product helpful too. The tube cleaner is an effective tool when used with the correct pads. Take care, though, only to fit one pad to the wand. If you (accidentally) fit two pads, the tool becomes stuck in the tube and is difficult, but not impossible, to retrieve. Good tip for others thanks Hilary.